When you meet Kristi Dahlgren, you quickly notice her beautiful smile. You also notice that she smiles a lot. Kristi is 21 years old and has been in the Mounted Eagles program for three years. She readily admits that horseback riding is her favorite thing to do and that she gets very excited on riding day. Kristi rides Bear who is one of the newest program horses. Kristi is a calm and patient rider. She works on her reining skills as she moves Bear around the riding arena. Kristi concentrates on the directions given to make sure she is holding her reins properly, sitting up straight and giving Bear good signals. She says that Bear listens pretty well, but will get better with more lessons. When working with Kristi, you will always hear some giggles and of course she has a big smile on her face. Kristi resides in Onamia with her parents Charles and June Dahlgren. The Dahlgrens agree that Kristi has become a much more confident young lady from her participation in the ME riding program. Kristi has also gained mus- cle strength and her balance has improved. 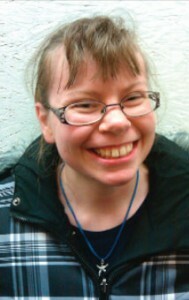 Kristi works in Onamia for a program that provides school readiness and is also a library helper. She loves to go to movies and her favorite movie is Never Say Never with Justin Bieber. Yes, she is a Justin Bieber fan! Kristi likes to make spaghetti, but says that she likes to eat any kind of pasta and cheesecake is her favorite dessert. Kristi loves to go to her Grandma and Grandpa’s farm in southwestern Minnesota and one of her favorite sum- mer trips was to Colorado. In her spare time, Kristi loves to play games on her Kindle and is especially fond of word finds. Her favorite TV shows are Little House on the Prairie and American Idol . She also enjoys crafts and card making. Kristi shares her artistic interests with a very important person in her life, her older sister Gail, who is an art teacher in Elk River. Kristi wants to be an artist just like Gail. When Kristi was told that she was selected as Rider of the Quarter, the first thing she said was “I have to call Gail!” Kristi, we enjoy your happy personality each week and look forward to your continued success. Congratulations on being selected as the Mounted Eagles Rider of the Quarter!